Keep up an appealing, stylish atmosphere with Beacon Hill Series recycled plastic receptacles. 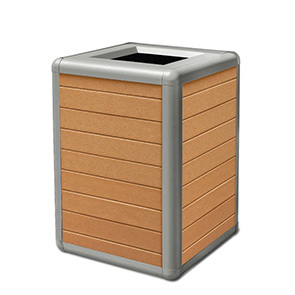 These robust 35 gallon waste receptacles feature recycled plastic lumber planks, available in either vertical or horizontal orientated pattern, exquisitely showcased by a contemporary styled aluminum frame with powder-coated finish. With two lid options to select from, both the open top and tapered bonnet lid are made from 11-gauge steel, designed to securely fit to the base and easy to remove for hassle-free servicing of the high-density plastic liner. 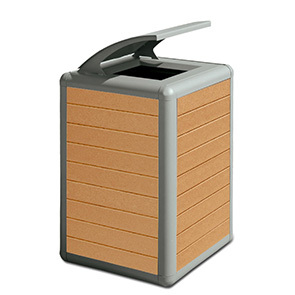 Eco-conscious and long-lasting, these high volume use waste receptacles will not rust or fade and are virtually maintenance free. Ready for use in a variety of indoor and outdoor applications, units come standard with rubberized leveling feet and pre-drilled holes for a more permanent type of installation.